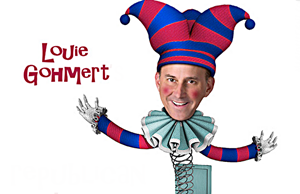 Rep. Louie Gohmert (R-TX) took to the House floor on Friday afternoon to offer a Third Reich comparison that was bizarre even for Third Reich comparisons..
After saying that Christians like himself really “love homosexuals,” Gohmert complained of being persecuted by LGBT Nazis! So it is amazing that in the name of liberality, in the name of being tolerant, this fascist intolerance has arisen. People that stand up and say, you know, I agree with the majority of Americans, I agree with Moses and Jesus that marriage was a man and a woman, now all of a sudden, people like me are considered haters, hate mongers, evil, which really is exactly what we’ve seen throughout our history as going back to the days of the Nazi takeover in Europe. What did they do? First, they would call people “haters” and “evil” and build up disdain for those people who held those opinions or religious views or religious heritage. And then the next came, well, those people are so evil and hateful, let’s bring every book that they’ve written or has to do with them and let’s start burning the books, because we can’t tolerate their intolerance. It takes a special kind of stupid to keep sending THIS special kind of stupid to Congress.